The media recently descended on President Muhammadu Buhari for allegedly describing Nigerian youths as lazy in a London roundtable. Although the media deliberately twisted Buhari’s statement as he did not use the word ‘lazy’ in his speech, I stand to contends that the president’s description of the Nigerian situation regarding its youths was apt, precise and succinct. Nigerians need to contextualize the president’s comment. We have seen many youths functioning as political thugs as the 2019 general elections approach. They have started vandalizing properties and disrupting political gatherings. Can anybody tell us that those political thugs are old men? What of the herdsmen who are terrorizing innocent farmers around the country? Are they not young people? Are they not lazy? Are the kidnappers who make life unbearable for innocent people not lazy? But are they not youths? Has anyone seen elderly people among Boko Haram insurgents and Niger Delta militants? What of the ‘area boys’ syndrome and the al-majiri phenomenon? 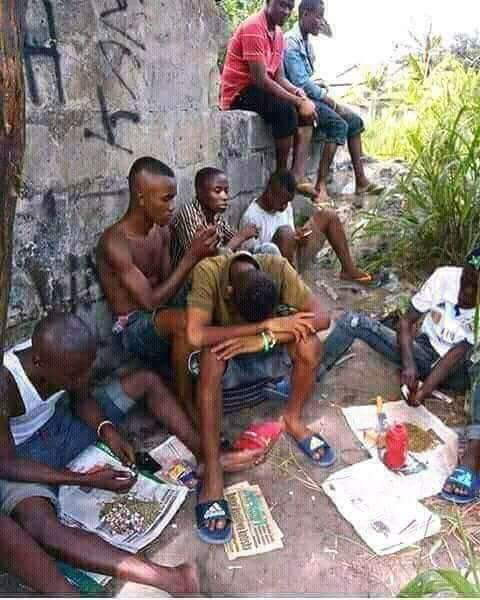 Are the Yahoo Yahoo boys not of the same age bracket? Are they not all lazy? What of the ‘agberos’ or touts who have now spilled out of motor parks unto the streets and bus stops? What responsible work are they doing? Are they not youths? What do they contribute to the Gross Domestic Product (GDP)? All they do is to stand at the bus stops to extort money from drivers of commercial vehicles. Are they not lazy? When will Nigerians admit this reality? Who pulled the wool over our faces? The problem with Nigerians is that they always run away from reality. Not known for verbosity, our president has hit the nail on the head. Many of our youths are lazy but we don’t want to admit it. Instead of commending this truthful leader, we started calling him names. Collective amnesia appears to have gripped Nigerians. We have forgotten that Buhari is not the only leader who described Nigerians and the youth in particular in this manner. Governor Dickson in a media chat on 17th May, 2016 was alleged to have said, "Bayelsans are so lazy, they want everything free, they don't want to work". The 25th September 2017 edition of a northern-based newspaper also reportedly quoted Alhaji Atiku Abubakar as saying, "Northerners are lazy" while General Babangida (rtd) allegedly opined during a BBC Hausa service interview of 16th April, 2010, "The Nigerian youth is useless, cannot lead." Senator Shehu Sani added flavour to this in December 2017 when he reportedly said "Northerners are lazy and unproductive". If indeed the above were the views of a governor from the South South, a leader from the South West, a former military president, an ex-vice president and a distinguished senator of the Federal Republic of Nigeria, all of whom are from the North, it stands to reason that Buhari has not said anything new. Neither is this pragmatic assessment of citizens by their leaders limited to Nigeria. During a town hall event overseas, ex-President Barrack Obama referred to Americans as lazy. Islam abhors idleness and laziness. It appreciates the dignity of labour. The Glorious Qur’an implores every man to work hard, “Tell them to work. (If they do) Allah, His Messenger and the believers (citizens) will appreciate their work” (Qur’an 9:105). To round up, we invite Nigerian politicians to brace up for a new political culture of probity, accountability and pragmatism. We call on the youths to abandon the counter-productive race for emergency wealth, to shun betting and to concentrate on education, training and hardwork. We charge parents to inculcate core values of honesty, dignity and diligence in their offsprings.